One of the most renowned players, Ace has just announced its most lavish project in sector 150, Noida. 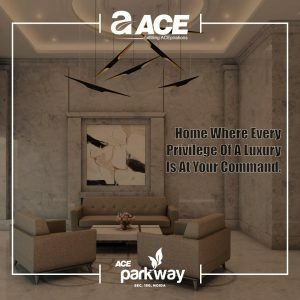 Ranked amongst one of the best projects in Noida Expressway, Ace Parkway is the answer to what a home buyer looks for. Soar high on life and give it a new definition with all the ultramodern facilities at the club house. Relax, refresh and recharge yourself with the exquisite coffee lounge for relaxing. A place where you can share thoughts with your dear ones creating a sensational environment for mindfulness. The project features approx 7 acres of green land dedicated with sport zone for 51 sports and fitness activities. A home is something we all have dreamt of, in our best possible imagination and we all strive to achieve the same. But there are many factors which hinders the mindset of an ideal home buyer who is burned with excessive prices in housing sector. Many real estate players build false dreams around providing something which is not possible and this leads to people losing their hope for a dream home. But some big & old names are still left in the market with the single goal of providing the most comfortable residential experience at the most nominal prices. This innovated residential development by Ace for providing luxurious apartments in Noida expressway is initiated to allocate a healthy & comfortable living in Delhi/NCR and for people looking in nearby areas. Major urgencies like shopping complexes, schools, entertainment hubs, & hospitals are in near vicinity, which further helps in sustaining a healthy experience. The project also benefits with its prime location, providing ease to all those travelling from Delhi/NCR and nearby areas. In short, the place marks as an ideal place for people considering for any kind of housing options near Noida expressway.